My Barakamon review for Funcurve is done, and you can expect it published soonish along with a blog post linking to it. It’s a little bit wordy, but I said all I wanted to say. Now I’m on to Sword Art Online II! If anything, I think Sword Art Online is fun and easy to write about. It’s a series with a particular charm to it that just makes me want to like it despite all the nasty stuff it does. Sword Art Online II is a legitimate improvement with slightly less nasty stuff, but not as much of one as I would like. After the break you’ll find a little snippet of the first part of my review. Hope you like it! Sword Art Online has become an immensely popular series with quite the polarising reaction. It’s not hard to see why. It’s an Anime about a Virtual Reality MMORPG, and its ideas are firmly planted within the worldviews and fantasies of a very sizable but very arguably problematic portion of both the gaming community and the Anime community. More than that, it pursues those ideas very earnestly, which makes it quite appealing to some and quite laughable to others. I kind of like the earnest nature of Sword Art Online. It doesn’t always pander on purpose, and even though that does mean it really is absorbed in its own ridiculous power fantasy and sometimes downright harmful attitudes, it at least shows that Sword Art Online wants to be good. I feel that helps to make Sword Art Online II a considerable improvement over the original series, although not quite enough to make this an easy recommendation to anyone who didn’t like the original series. It pulls quite a few compelling ideas, and even manages to expand an odd few well, but it continues to fall back on many of the big issues of the first series. Despite that, all of Sword Art Online II demonstrates a series that, at the very least, honestly tries to learn from some of its worst mistakes. Sword Art Online II begins in the Phantom Bullet arc of the source material. Kirito finds himself in Virtual Reality Shooter ‘Gun Gale Online’, in search of player going by the ridiculous pseudonym of Death Gun who’s believed to be responsible for murdering players in game. He takes part in a GGO tournament, given the similarly ridiculous title of “Bullet of Bullets”, in order to garner Death Gun’s attention and get to the bottom of the mystery. 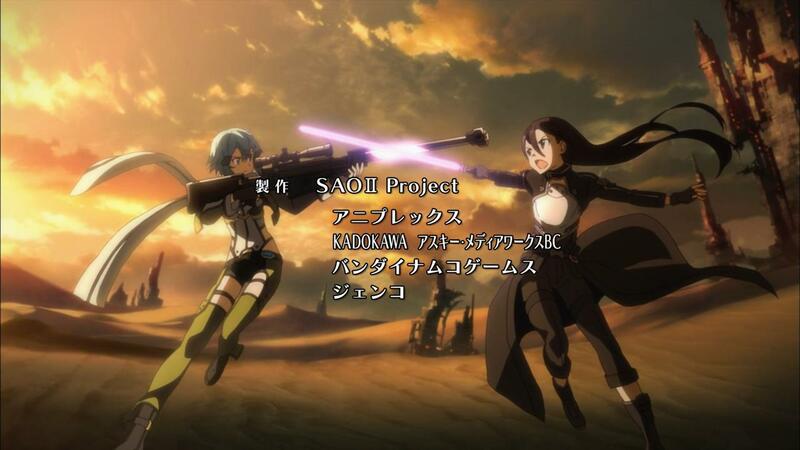 Along the way he finds himself tagging along with Sinon, a young girl with a very much scantily clad character avatar who plays GGO to overcome her crippling fear of guns. GGO itself is a much more clearly defined setting than the previous ho-hum fantasy settings of Sword Art Online and Alfheim Online, with mechanics that are more easily understood and which the combat is shaped around. This allows the action set pieces to carry a lot more urgency and excitement than many of SAO’s previous flashy attack spams. Sinon also happens to be a lot more defined as a character than any other characters we’ve seen thus far in SAO. Kirito does have a tiny bit more personality this time around, and finally starts to feel bad about the people he killed while in SAO (although it’s not quite clear where all this came from), but it’s safe to say Sinon is a more compelling addition. She’s backed by a concrete character arc, one that happens to be decently compelling, if a tad melodramatic. Sinon sees games as almost being an absolute escape from real life. This is, to me, a potentially dangerous way to view games, but it’s a view that we’re made to understand emotionally. We learn that her fear of guns is built on a traumatic personal experience where she shot and murdered a robber. She shot him three times in typical enough accidentally over-the-top SAO fashion, but this back story still outlines her conflict well despite that. When Sinon is in GGO, she’s empowered by the subconscious disconnect to not only use guns but to use them confidently, and so she sees GGO as a means of ultimately overcoming her real world fear of guns. There is a certain degree of disconnect, and many gamers feel empowered by it to the extent it’s easy for them to believe games exist entirely in a vacuum. That’s essentially how we’re made to understand Sinon’s viewpoint. Unlike the first series, Sword Art Online II doesn’t simply brush over those ideas; it builds a tangible thematic core from them. There are certain obvious shortcomings from the first series that Sword Art Online II hasn’t fully overcome. In terms of pacing, it fares somewhat better than the first series in actually being able to pull some scenes together, such as the aforementioned action scenes. For the most part, however, it comes off as obviously padded, dragging scenes on and reiterating things we already know fairly frequently. Some Anime adapted from source materials struggle with fitting a certain episode count gracefully. Sword Art Online II, despite doing a little better than the first time around, still manages to be a consistent offender. Aside from that, there’s still a pretty bad spread of dry Light Novel tropes. Kirito being the self-insert socially awkward but secretly special protagonist he is, Sinon filling in the role of the submissive generic tsundere many times, just a whole lot of the usual terrible bits and pieces that one would unfortunately expect from SAO at this point.